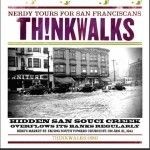 THINKWALKS » A Creek Through the Wiggle & Across Market at Church St. 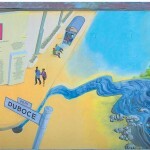 When we designed the mural (1996 & ’97) I was the information source on this old creek. But I got the main thing wrong: A creek didn’t flow in the places where the Wiggle goes. I hereby recant (as I’m fond of doing) in great detail (as I’m also fond of doing). I thought that the Wiggle follows an old creek bed. Half right! Only the part from Duboce to Market Street actually does. Sort of. The other part, north and west of Duboce Park, was so sandy that nothing flowed on the surface except during storms. Sand soaks up a lot of water. The 1876 Humphreys map shows a guess at the original course, ignoring the diversion it suffered in the late 1700s. See! Maps lie. 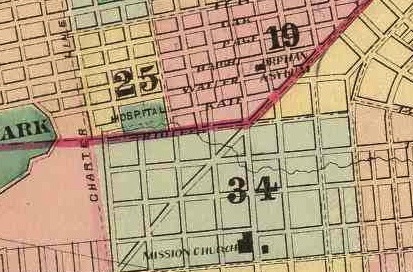 The green rectangle lyingly labeled HOSPITAL became Duboce Park. Luckily for my half that was right, an actual creek did emerge at the base of the southernmost dune, right at Duboce Avenue (about where Sanchez is). Here’s a rundown of what I now know about that creek. It flowed from a spring that emitted water absorbed by the dunefield. From there it flowed strongly across what is now Market Street at about Church Street. It went down 15th Street at the base of a cliff (since removed) near Dolores Street. 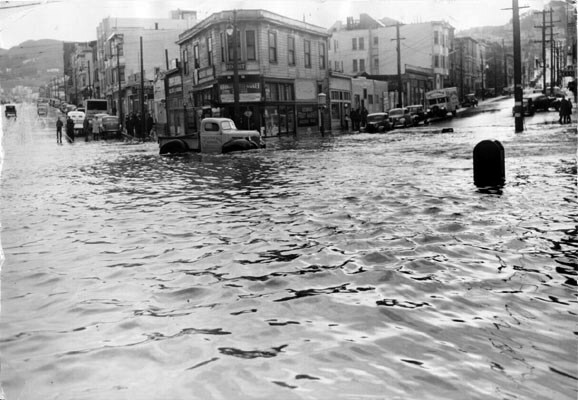 Then it went over to 14th and entered a freshwater marsh, which in turn flowed into the tidal waterway called Mission Creek at 14th and Folsom, about where Rainbow Grocery is today. Before I address the tricky matter of its name, here’s the creek’s prehistory: Going back 10,000 years, it was the ice age and the dunefield hadn’t formed, yet. 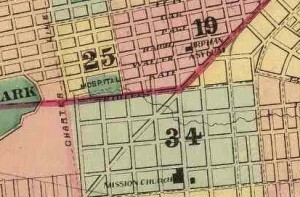 The bedrock valley that’s now buried in sand was an actual creekbed flowing all the way from Golden Gate Park down to the Mission District and into a river valley which existed where the Bay is. Starting about 5,000 years ago, a “village” called Chutchui was along the creek near Market. It was actually more of a campsite used during summers by Yelamu Ohlone indians. The creek’s brief history: The strength of the spring was Captain Anza’s cue to locate the Mission just south of the dunes. They needed enough water to irrigate crops and orchards. The creek was channeled almost immediately. According to research by Christopher Richard, an irrigation ditch was dug to divert the creek southward from the source. The couple hundred residents of Chutchui were conscripted as the first labor for the Franciscan padres who founded Mission Dolores. Indians were called “diggers” but probably not for their new pastime as ditchdiggers. More likely, it’s because they made baskets from rhizomes dug out of the creek banks. 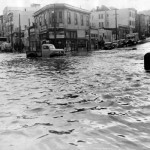 The January 1941 flood on Market Street. This was 31 years before the Muni Metro and 60 or so years before the vent was installed that acts as a drain into the station today. Today, the creek flows in the ground, through fill soils and in the sewers. In storms, the creek returns. When the sewers fill, the water flows along the gutters. At least twice a decade, a bigger storm fills the whole street with water. A tunnel entrance at Duboce and a vent at Church and Market allow it into the subway—something designers may regret some day. The Muni Metro, at both the Van Ness and Church stations, closes for a few hours while the water gets pumped out again. Eventually, the pavement will wash away and the creek will return. Simple as that. Whether the creek is restored by design or by the caprices of extreme weather is up to us. The creek remains unnamed. Anza called it Dolores Spring (Ojo de Agua de los Dolores) because the day (in 1776) was the Feast of Sorrows (dolores). His geographer, Father Font, called the creek Dolores Creek (Arroyo Dolores) in his journal from the same expedition. 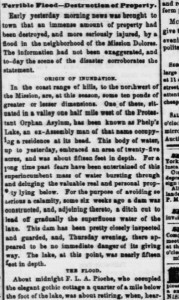 We could simply use this name, except it would be confusing: Within months of Anza and Font, Father Palou (a geographic ignoramus) applied the name to another creek flowing where 18th Street is—and it stuck. Using ‘Dolores Creek’ would require also renaming the 18th Street creek. In the winter of 1861 to ’62, the largest storms ever recorded caused deep pools of water to collect in the dunefield. One covered 25 acres, in the Panhandle Park (which didn’t yet exist). When the sand gave way, slurry gushed furiously along the creek’s original bed. The deluge was so strong that it crushed Francois Pioche’s mansion to matchsticks. He was one of SF’s top financiers and his ill-fated L’Hermitage “guest cottage” was one of the few houses nearby at that time. 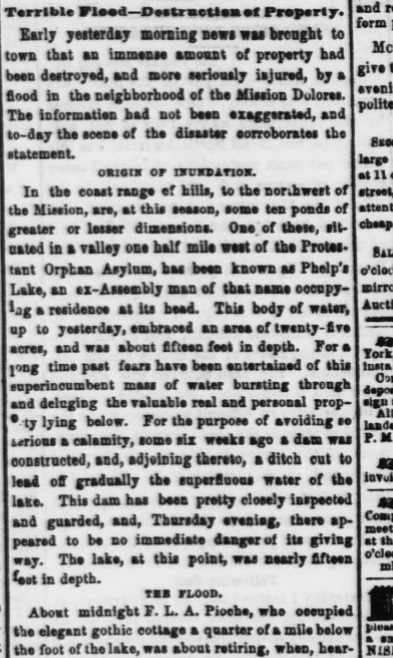 The popular (but incorrect) notion was that the floodwaters had come from a different over-filled lake: Sans (or San) Souci Lake was where the low part of Divisadero Street is now. It lapped the doorsills of the San Souci Roadhouse at what is now Fulton and Divisadero. As a result of this storied flood, the creek valley became known as Sans (or San) Souci Valley until at least 1920. The valley extended to the Panhandle and Lone Mountain. It was graded for roads and developed starting in the 1870s. 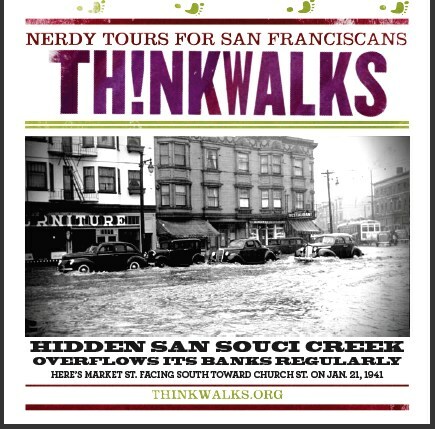 Perhaps the creek should be called San Souci Creek, as I did on my early Thinkwalks flyers. I like that name because sans souci means carefree in French. It was often spelled to match the San in ‘San Francisco’. Since someone saw fit to drop an ‘s’, I hope to drop an ‘e’ and make Carefree Valley into Carfree Valley someday! I predict spelling-wars if the creek is named San Souci. When I pose the question of naming to folks on my walking tours, the consensus is often to name it for the Yelamu campsite. Sadly, I have little information about its location(s) and less about how we came to know the name. Have another name for the creek? Please contribute your comments and suggestions below! Previous article: The Earth did the Wiggle!